Help Choose The New(ish) Cover For The Glass Wives! 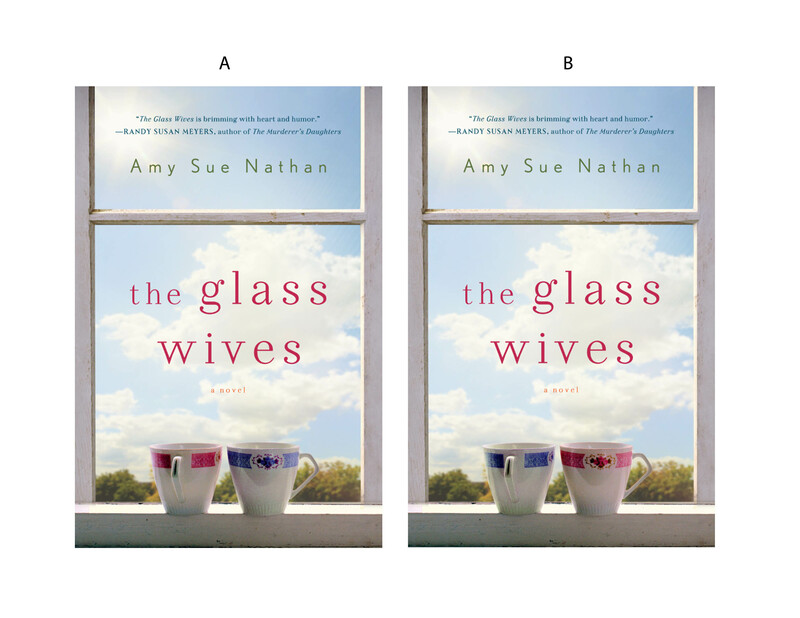 You are here: Home / Uncategorized / Help Choose The New(ish) Cover For The Glass Wives! We’ve tweaked the cover for The Glass Wives, my friends! Can you believe it? I loved, loved, loved the original cover but this change makes sense to me as it represents the two main characters in the book as being different, as well as similar. That being said, WE want to know what YOU think! Which cover do you prefer? That’s right! My editor and my publisher want to know what YOU think (they are awesome like that). The original cover is off-the-table, so pick A or B and have your say! You can leave me a comment as well, of course, and let me know your thoughts. I know it seems like a small change, and while it might be technically small, a lot of very smart publishing professionals have put their heads together to come to this conclusion. I am fortunate they care so much about The Glass Wives, even if I did have teacup nightmares once or twice since last week. When the cover is officially official (again) I’ll post it here! You can click on the image below to see the covers even larger. Don’t forget to participate in the poll below! I voted for A just because I seemed to see it louder, but I really like what Juliet said! I agree with Juliet about B tying in with the writing. Even though I favor blue over pink, aesthetically the blue cup blends with that lovely sky more and the pink stands out. Thanks for letting us chime in, Amy! Fun! Another B vote here! I don’t know why, but it popped more for me. I think it’s because pink, as a derivative of red is more of an eye-catching color, so I liked “punctuating” the sequence of the teacups with more of a statement/eye catching color. “Punctuating” it with blue, the blue got more lost. Fun that they want to know what we think! Yay! B without a doubt! As a visual, the red picks up the color of the title and draws the eye in a nice diagonal from left to right, which is the way our eyes naturally want to go on a book. I think this is a great tweak, having mismatched teacups, because that says a lot about the wives. Nice that your publisher is willing to play with the cover–and have people weigh in! I was thinking the same thing!! Like one should be a big clunky homemade thing and one a delicate little teacup like it is…or something really obvious. B grabbed my eye more quickly. What fun… I can totally see why they changed it. It IS those subtle things that make connections between the words UNDER the flap and the presentation ON the flap. My eye, like the others, is drawn to B. B the Colorado popped more.